"HOW TO JUDGE GENERAL FORTUNE THROUGH ASTROLOGY"
This verse from "Sri Ramcharitmanas" gives us the key to happiness. Unless one feels content with one’s lot, the mind would be restless and would always be craving for something or the other. Jupiter and the Sun, when strong, indicate the overall happiness in a nativity including elevation of the soul. So to say, happiness and spiritual attainments in life are indicated by the position of Jupiter and the Sun in a nativity. The Sun is the significator of father, status in life, vitality, soul and is secondary significator for male progeny. Jupiter, the planet of "Divine Grace" is significator for all the good things in life. It is the lord of the ninth sign of the zodiac and natural significator for bhagya (fortune). Its main significations are blessing one with auspiciousness, sons, wealth, good conduct, ministership and good health by giving a healthy liver which is the factory of human body for nourishment of all its parts. It also represents charitable disposition. The learned Kalayana Verma in his book, Saravali, stated that Jupiter rules auspiciousness, virtue, prowess, preceptorship, deputation, gold, social position, gains, residence and sons. Varahamihira in Brihat Jataka says that Jupiter represents wisdom and happiness. It is moral and controls treasury. Saravarth Chintamani, states that whenever in a nativity Jupiter is in fall, the native concerned is less virile, grieved and is in adversity, mean in conduct, dunce, bad end, penury, serves others, bereft of auspiciousness, memory, purity, etc. Experience shows that one is not only grieved but crosses the border of morality/wisdom to achieve one's ends and becomes selfish and unsatisfied. One is intemperate. Efforts made do not give desired results. Both physical and mental sufferings are caused to the native. It is especially harmful in the case of females as it is the significator of "husband" in a female nativity. In Indian cultural background a female is treated as "reborn" after her marriage takes place. Her post-marital life depends on the position of Jupiter in her natal chart to a large extent. The life may seem to be settled otherwise but during the main/sub-period of a weak and afflicted Jupiter, it suddenly becomes shattered or crumbled. Jupiter, who is known for removing afflictions/weakness of other planets and houses, when afflicted itself, causes misfortunes. The lord of the ninth house when strong in the nativity, acts as an additional Sun for the person. Before citing a few charts where the natives met with misfortunes changing the course of their lives during the main period/bhukti of a weak and afflicted Jupiter, we would like to add that astrological advice does have the competence of reducing the mental and physical sufferings caused. The parents of the children born with such combinations will have to work very hard from the very beginning in forming the right attitude of kindness and helping/serving others. Righteous conduct is the key to all remedial measures. To sum up, the significations of Jupiter suffer in case it is weak or afflicted. Though in some cases the lord of the ninth house may either occupy the house or aspect it fully, yet during the sub-period of an eclipsed Jupiter the native is aggrieved on account of the significations of Jupiter. The studies show that even where the Sun was lord of an auspicious house, and no astrological remedial measures to remove the weakness of Jupiter were taken, the combustion of Jupiter in transit inflicted sufferings upon the natives relating to general and particular significations of Jupiter. This leads us to conclude that the clues provided by classical texts on the result of weak planets including combust planets hold good if the functional benefic combust planets are not strengthened. The ascendant lord is both debilitated and combust. Jupiter, Mercury and Venus are also combust. Jupiter lacks power to augment auspiciousness in spite of its occupying its sign of exaltation in the rasi chart; occupying fourth house being the ninth lord and being in exact conjunction with another angular house lord, Venus, as it is weak due to the weakness of its dispositor, the Moon. All planets placed in the fourth house become weak. The girl could not get married in spite of the best efforts of her parents. In spite of the eleventh lord occupying its sign of exaltation, the girl could not get employment. The reason, apparently, is the combustion of the dispositor of the eleventh lord and eleventh lord occupying its debilitated navamsa. Mercury is combust and under the close aspect of Rahu which has put a tremendous amount of nervous pressure on the native due to remaining unmarried and unemployed. The putrakaraka, Jupiter, is occupying the twelfth house. The lord of the fifth house, Mars, is combust. The secondary significator for male progeny, the Sun, is also weak as its dispositor is in the eighth house. In sapthamsa, Rahu afflicts Jupiter and the Sun. The placement of the lord of the eighth house on the most effective point of the eighth house is good for long life, rich inheritance, easy gains, etc. but for the matters of status rise, birth of a male child and accumulation of wealth this is a very negative factor. The native suffered on account of male progeny. He lost his four male issues, two by way of abortions in advanced stages and two in premature deliveries. Due to the exalted Moon in sapthamsa ascendant, the native has four daughters. Jupiter is weak as it is occupying the twelfth house in extreme old age and its dispositor is under the exact affliction. Jupiter is the lord of the second house. The fifth house is closely afflicted by Rahu-Ketu axis. The lord of the ninth house, the Moon, is in infancy and weak. Mercury is combust and the most effective point of its mooltrikona house is under the close affliction of Rahu-Ketu axis. Mars ruling the house of health is exactly conjunct with the most malefic planet, Venus, which resulted in persistently sensitive health. Mars and Venus mutually afflict each other. The weak planets and the exact/close afflictions caused many fortune reversals for the native. The native was not blessed with male progeny up to the age of 35 years. Remedial measures for strengthening Jupiter and propitiating the functional malefic planets have blessed the native with a male child. Female born 22nd June, 1960, 0900 Hrs. 28.39N 77.13E. Jupiter is weak as it is badly placed in the twelfth house and combust. The lord of the tenth house, Mars, is weak due to combustion. The prime significator for male progeny for Cancer born persons, the Sun, is also weak as it is in the twelfth house. Mercury and Venus are in infancy and suffer from the close affliction of Ketu and Rahu. The native of this chart had marital and progeny problems. She was first married in May, 1982, followed by immediate divorce. She was remarried on 19th April, 1986. The first child of the native was still-born in April, 1987. Remedial measures were suggested for strengthening of the functional benefic planets. The native gave birth to a male child in the first week of October, 1988. Jupiter is weak as it occupies the twelfth house in its sign of debilitation. The Moon becoming one of the prime determinants of health is under the exact affliction of Ketu. The lords of the eighth, third and ninth houses are weak due to combustion. Mercury closely afflicts the most effective point of the second house. The native is suffering from ill-health on account of sluggish liver, diabetes and corpulence. Her only son also is not keeping good health. Her husband suffered setbacks in health and career after her marriage during the main period of Jupiter. The debilitated Jupiter ruling the twelfth house is occupying the ascendant. The prime significator for longevity is the Sun, which is weak due to old age. Mercury, ruling the house of fortune, is weak as it is combust and badly placed. The Sun being the most malefic planet is close to the most effective point of the eleventh house and afflicts the fifth and eleventh houses. The Moon suffers from the close affliction of the functional malefic Jupiter. Mars is weak as it is in the state of infancy and its dispositor is weak. Saturn is weak as it is badly placed. As all factors governing longevity were weak, during the Ketu sub-period of Jupiter main period, the native breathed her last at the age of 39 years. During her life she suffered on account of strained marital relations as the lord of the seventh house is closely afflicted by Jupiter and lord of the second house is badly placed. Jupiter, ruling the house of fortune, is weak as it is in infancy and debilitated both in rasi and navamsa. The lord of the fifth house is weak as it is debilitated; is in the state of infancy and its dispositor is weak due to bad placement. The Moon, ruling the fourth house, is suffering from the exact affliction of the functional malefic Mercury. Rahu/Ketu axis closely afflicts the most effective points of the houses occupied and aspected. During the main period of Jupiter the native changed his jobs frequently but could not get satisfaction. In Jupiter sub-period, the native met with an accident and had a leg fracture. His wife was diagnosed as a patient of uterine cancer. He has only two daughters and no male progeny. As Jupiter is the lord of the ninth house, the native suffered setbacks in all spheres of life. Jupiter is in the fifth house in its sign of debilitation and is weak. The fourth house is occupied by Rahu and Mars. Mars, being the most malefic planet, is close to the most effective point of the fourth house. The lord of the ascendant is weak as it is occupying the sixth house and is under the close affliction of Ketu. The malefic influence on the fourth house and Mercury (the significator for education) is grave while the fourth lord is weak. After the birth of the native his mother suffered on account of persistent ill-health. The native developed enmity with his mother. The native disrespected his mother and even used to beat her. He left his school in the ninth class and started loafing around aimlessly. The domestic peace was completely disturbed as the native was undergoing the main period of Rahu which is occupying the fourth house owned by a debilitated Jupiter. The performance of suggested astral remedies in the form of a Kavach and charities helped the native to complete his school education and gave improved health to the mother. Male born 4th January, 1973, 2115 Hrs. 73E02, 29N42, India. 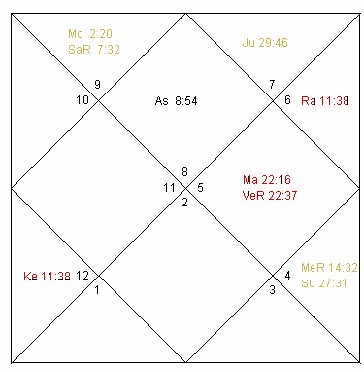 Jupiter being the lord of the fifth house, dealing with intelligence, is weak as it is combust and suffers from the close affliction of Rahu and Ketu. The lord of the ascendant, the Sun, is in exact conjunction with the most malefic planet, the Moon, and is also under the close affliction of Rahu and Ketu. From Jupiter sub-period in the main period of the Sun onwards the native developed strange food habits, enmity with mother and disinterest in his education. He left school in Ketu bhukti in the Sun main period. Remedial measures for strengthening of Jupiter and Sun and for propitiating Rahu and the Moon were prescribed. The boy started showing improvement, was readmitted to the school and continued his education. The performance of astral remedies helped him in completing his graduation and the native had then being successfully attending to his parental business enterprise.